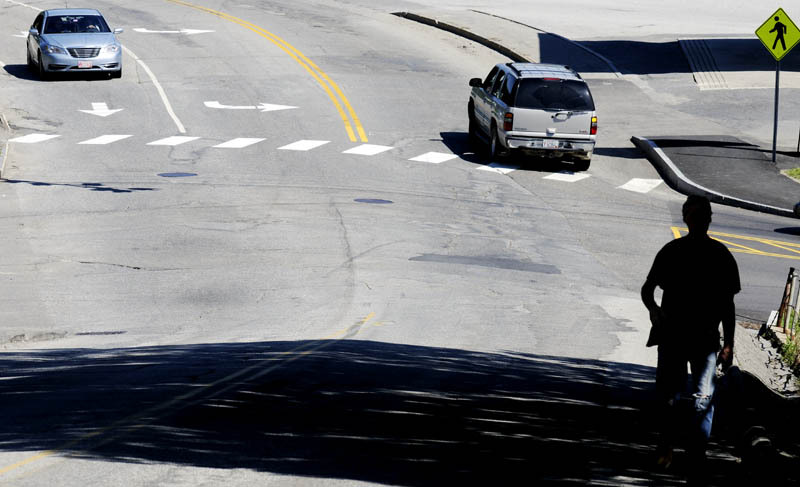 A State House fight over the timing and approval of $100 million in state transportation bonds has threatened several central Maine projects, including repaving of Mount Vernon Avenue in Augusta. AUGUSTA — Scott O’Brien, owner of Augusta Florist, says he’s been told for several years now that the state will repair the bone-rattling surface of Mount Vernon Avenue. The business owner on that road is still waiting, even as state legislators and Gov. Paul LePage spar over a proposed $100 million transportation bond that would include the Mount Vernon Avenue project. The Mount Vernon Avenue repairs, O’Brien said, would be welcomed by businesses — other than mechanics who likely get some business out of replacing vehicle parts rattled loose on the road. He said businesses on the road lose customers because of the condition of the road surface and that its aesthetically unpleasant appearance may turn people away from venturing further into the city. “I just had a customer the other day who said her mechanic asked her, ‘What’d you do, take your car down Mount Vernon Avenue? '” said O’Brien, whose business has been there for more than 20 years. “Actually, she had. If you travel the road, you know what it’s like. It’s not a pretty road to travel. Both Democrats and Republicans support the transportation projects, but they disagree about the bond’s timing and method of approval. Augusta area Republicans are turning up the heat, saying Democrats have failed to act and don’t want to send the bond proposal to voters until June 2014. They say such a delay would prevent the state Department of Transportation from being able to do the work by the spring 2014 construction season. In a news release issued by local Kennebec County Republican members of the House of Representatives, the legislators say are concerned the bond could be “used as a political bargaining chip by Democratic leadership in the Legislature,” by merging the transportation bond with other bonds, and forcing a vote on the combined borrowing packages. Democrats, however, say it is Republicans and specifically LePage who have delayed bond proposals that could help put Mainers to work and fund much-needed infrastructure improvements. And Democratic legislators said lawmakers were assured by the commissioner of the Department of Transportation in July that the agency’s work plan could move forward as long as the bonds go to voters on or before June 2014. The Appropriations and Financial Affairs Committee is scheduled today to begin discussing bonds, including the proposed transportation bond. Democrats said legislative leaders agreed in July to reconvene to take up bond proposals in September, when the Senate would be in session anyway to confirm political appointments, after LePage released $104 million in other bonds already approved by voters. They said the governor held off issuing those bonds for two years. Republicans said the agreement to pay off debt owed to hospitals allowed LePage to “responsibly” issue bonds previously approved by voters, which are currently being prepared for sale by the Office of the State Treasurer. “The last thing we need in Maine is the kind of Washington-style brinkmanship that has threatened jobs nationwide,” Rep. Dennis Keschl, R-Belgrade, said in the release. House Speaker Mark Eves, D-North Berwick, and Senate President Justin Alfond, D-Portland, said in a release that Democrats have been urging the governor to authorize the already-approved, job-creating bonds for more than 600 days. The $100 million state bond would leverage roughly $150 million in federal funds to help fix Maine’s transportation infrastructure. The proposal would bring about $15 million in improvements to help fund work on Kennebec County roads and bridges, including repairs to: 1.5 miles of Mount Vernon Avenue in Augusta; 3 miles of Route 8 in Belgrade north of Route 27; 12 miles of Route 23 in Sidney and Oakland; intersection improvements to the Interstate-95 Exit 109B off-ramp in Augusta; safety improvements at the intersection of Route 27 and Darin Drive in Augusta; improvements to the intersection of U.S. Route 202 and Main Street in Winthrop; and repairs to Western Avenue Bridge in Waterville.